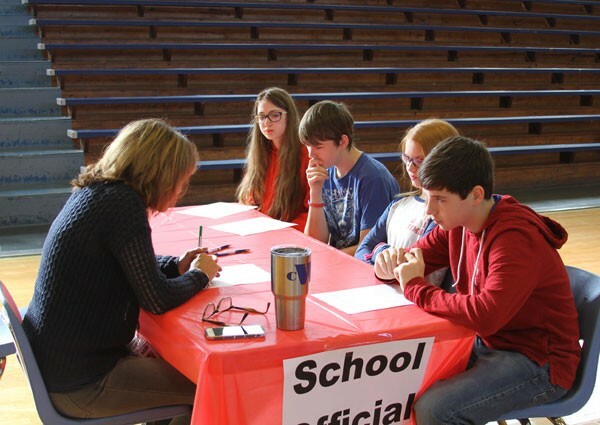 Adair County Middle School seventh grade students participated Friday in a program designed to steer kids away from reckless and illegal behavior by showing what can happen when people make poor decisions. The event, dubbed “Truth or Consequences,” gives students different crimes, then – as if the students had actually broken the law – sends them around to meet with various organizations to learn the crime’s consequences. The program was presented this year as a joint effort by the Adair County Cooperative Extension Office, ACMS, Adair County Youth Services, and the ACHS 4-H Leadership group. Volunteers set up at various tables for students to visit included local law enforcement, school officials, representatives from the state Dept. of Juvenile Justice, District Judge Michael Loy, and County Attorney Jennifer Hutchison-Corbin. ACMS students Hailey Turner, Haidyn Griffith, Maggie Cox, and Lucas Pooler had to meet with ACMS Counselor Cindy Wells Friday at “Truth or Consequences” after they were assigned the crime of stealing road signs.